Kathua, April 14: India has called nuclear-armed Pakistan's bluff with its air strikes on terror camps in that country, Prime Minister Narendra Modi said on Sunday, adding that one country cannot have two Prime Ministers. 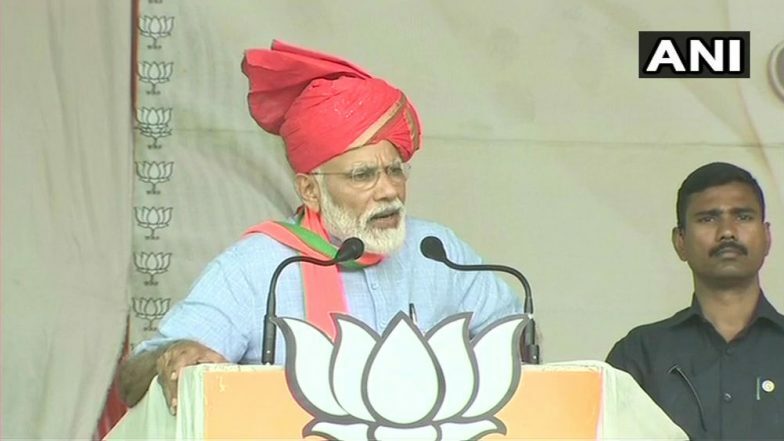 Referring to the air strikes by the Indian Air Force (IAF) at Balakot, Modi told an election rally here: "Pakistan and its supporters have been threatening us for long with its nuclear capability but the IAF called its bluff with its strikes. PM Narendra Modi and Bihar CM Nitish Kumar’s Love Stronger Than ‘Laila-Majnu’, Says AIMIM Chief Asaduddin Owaisi. In his speech, Modi took on both the Congress as well as the National Conference and the Peoples Democratic Party (PDP). Accusing the Congress and its allies of always criticizing him for highlighting India's security situation, he said: "They do so because they never fully trusted the country's defence forces. "These corrupt families of J&K must know that Modi will stand like a wall against their attempts to continue their family rule in the state. They may keep abusing me but they will not succeed in dividing this country. "They have already destroyed three generations of people in the state." Modi also promised citizenship rights for West Pakistan refugees and the return of Kashmiri Pandit migrants to the Kashmir Valley once he was voted back to power. PM Narendra Modi Trains Guns at Captain Amarinder Singh For not Attending Government Event on Jallianwala Bagh Massacre Centenary.